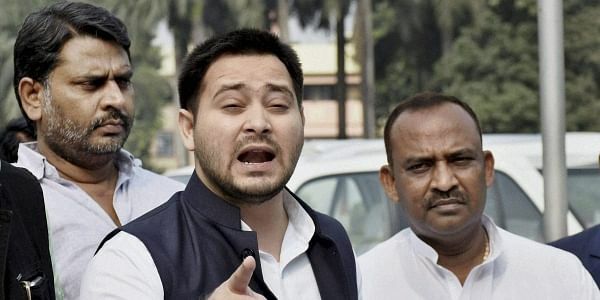 Bihar opposition leader Tejashwi Yadav on Wednesday targeted Chief Minister Nitish Kumar for saying that he had acquired the traits of his father Lalu Prasad. PATNA: Bihar opposition leader Tejashwi Yadav on Wednesday targeted Chief Minister Nitish Kumar for saying that he had acquired the traits of his father Lalu Prasad. The younger Yadav said he was proud that he had acquired the traits of his father and questioned the Chief Minister if his son has acquired his traits. On Monday the Bihar Chief Minister said: "He (Tejashwi) is a child. Sometimes, he speaks loudly and becomes personal. How can he get out of the shadow and the traits acquired from his father, despite his career being damaged by him. The entire family is passing through a phase of frustration". To which Tejashwi said Nitish Kumar was right in calling him a child as in Indian tradition, a "person remains a child to his or her parents and elders". Tejashwi said he would not call Nitish Kumar an old person as he had high regard for him. Lalu Prasad on Monday said Nitish Kumar will soon realise what Tejashwi Yadav is. "Nitish Kumar will taste the existence of Tejashwi Yadav on the ground in the 2020 Bihar assembly polls"